Proud wooden plugs with pillowed ends are a decorative hallmark of Greene & Greene style furniture. Usually these plugs appear in ebony, but they serve the same purpose in any contrasting hardwood. The wood for the plug should be good and hard so that the end polishes up nicely, and so that it appears to actually hold the joint together. I have had mixed success introducing these stylized plugs into other furniture designs (other than G&G and arts and crafts). I like them in incorporated into some Japanese styled furniture, likely because the G&G style mimics so much of the Japanese styles, and they are dynamite in certain exposed joint/rustic timber frame styles and even some ultra modern pieces if they are used appropriately. The entertainment center I am building (maybe I'll finish before my daughter goes to college?) is an homage to the age of our home. The home is over 115 years old and has seen a myriad of interior designs from some beautiful Victorian/Stickley, to some rustic timber, to some hideous 60s paneling... and worse. I decided to borrow from the earlier home finishes and try to harmonize some Victorian elements with arts and crafts and some dulled down timber frame rustic elements. I realize that this sounds like an unplanned hodge-podge of styles but all of these design concepts share some similar basic elements, similar enough to tie one into the other. One of those elements is a set of rather large pegs that sit in an exposed timber style scarf joint. Typically, these pegs are square on the end as they are pounded in by a large commander (mallet) but I chose to pillow the end of these for some style and just push them in by hand. 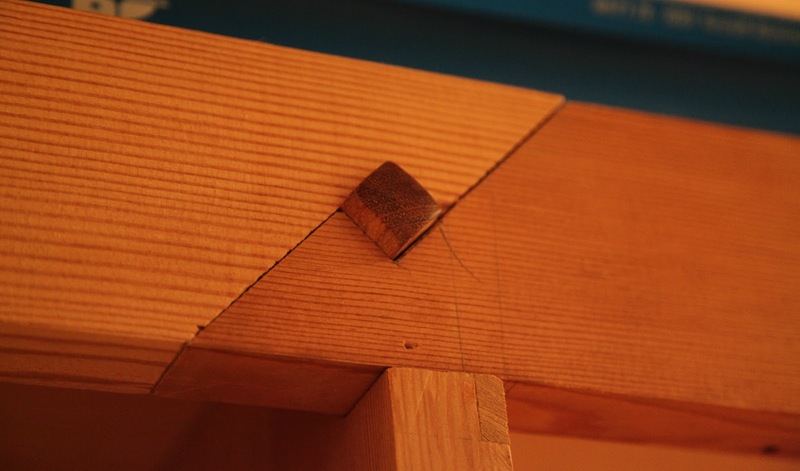 Additionally, this joint usually has the pointy ends tucked into the opposing piece (see LumberJocks) and the pin is driven in or wedges are used to drive the ends of the joint tight. This piece was so small and these pieces of narrow, well seasoned douglas fir tend to be a little brittle and I feared the ends might break off inside the joint. Fortunately, this joint is more decorative than it is structural, so this modification won't effect the strength of the overall piece. The narrow gaps will tighten up with the weight of the shelf, 3/4 mdf core straight grained douglas fir plywood that fits into a rabbet on the back side. This joint will also get some decorative leather strapping (instead of the tucked points) which will help to finish up the joint as well. Once I know the peg fits, I'll trim the back end off so that it sits just proud of the hole. Cutting these plugs is a relatively straight forward task but getting the nice domed end takes a little trick, some Super 77 and aluminum oxide. The task is very simple, in fact I did this one sitting at my kitchen table (don't tell the wife). Just take the square ended plug and draw some circles. The circles on the sandpaper are intended to wear the corners down first so at first only the outer perimeter of the square is worked on the sandpaper and as it wears toward the center, eventually it will wear a dome shape into the end of the peg. Hey, finally a simple project! Didn't I See This In A Movie? Using steadily increasing grits of sandpaper (120, 300, 600) the end of the peg gets polished and with a little wax will finish up nicely. These are better to shape while they are long and then trim them to length so that they fit just proud of the hole. Shaping them before cutting them to length makes drawing the circles much easier and prevents sanding off your finger tips!